Miyako Shrine was erected in 1590, and is the shrine situated at the southernmost location in Japan (as a shrine that is under the comprehensive administration of the Jinja Honcho or Association of Shinto Shrines). Kumamo Mikami (three deities of Kumano) and Toimiya Mikami (local ancestral leaders) are worshiped here. Please refer to "About Miyako Shrine" for details. There are a variety of ceremonies held throughout the year, including the Annual Festival of Miyako Shrine on October 26, Miyakojima Island Summer Festival of Prayer for Good Harvest in July, as well as Tsukinamisai (monthly festivals) held on the first and 15th of each month. The book "Miyakojima Kyuki" (Chronicles of Miyakojima Island) dating back to the 18th century (1707) contains following entry: Long time ago, there was a person called Taira, a Shuiufuyagu (a government official of the time) who lived in the village of Shirima on Miyakojima Island. He traveled to the Administration of the Ryukyu Kingdom at Shuri on the main island of Okinawa to deliver tribute articles. On his return, his vessel was shipwrecked off the coast of Korea. The locals considered him to be suspicious and were about to execute him. He prayed to gods and wrote down the name "Ryukyu" on the ground. They then understood that he was a Ryukyuan and protected him. Taira was able to return eight years later. Upon his return he was grateful for the gods of his homeland who protected him so in 1590 prayed and invited the deities at Naminoue Shrine at Naha on the main island of Okinawa to dwell on Miyakojima Island. A survey (land survey) of farmland was conducted by the Satsuma Domain in 1611. A shrine with clay tile roof was built at the time, based on the counsel offered by the Satsuma Domain to the Royal Government of Ryukyu Kingdom. This building was referred to as "Miyako Kumano Sansho Gongen" (manifestation of three deities of Kumano at Miyako). Taira Town (present-day Miyakojima City) on Miyakojima Island rebuilt Miyako Shrine in 1925. The shrine used to deify and worship Yonahakeigen-no Mikoto and Nakasonegenga-no Mikoto, who used to administer Miyakojima Island. As the time passed on Miyako Shrine was in need of repairs. Miyako Kumano Sansho Gongen also required repairs. 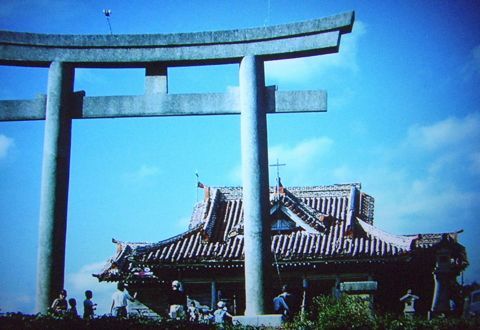 Taira Town decided to build a new Miyako Shrine by merging the then existing two shrines in 1940. The name of Miyako Kumano Sansho Gongen, which was already a nationally accredited shrine at the time, was changed to "Miyako Shrine" and the two pillars of deities from the former Miyako Shrine, namely Yonahakeigen-no Mikoto and Nakasonegenga-no Mikoto, were incorporated for worship in the same year. The main building of the shrine was completed in 1943 at No. 5 Nishizato. The building, however, sustained damage from the war. The enshrined deities were temporarily relocated to Harimizuutaki. The burnt remains of Miyako Shrine were used by residents and also as a Christian church but it was later demolished and a community center was built on the vacant lot. The building from the time it was a church. A cross can be seen on the roof. The "Miyako Shrine Restoration Association" (an organization established to restore Miyako Shrine) was organized in 1949. Meguromoriteisei-no Mikoto was added to the enshrined deity in 1956. The temporary building of Miyako Shrine was built at No. 1 Nishizato in 1972 as Okinawa, which was under the American rule was restored to Japan and the shrine acquired the status of religious corporation. The new shrine building was completed at No. 1 Nishizato in 1980. The period transitioned to the Heisei era. The shrine building of Miyako Shrine was deteriorating from age. Taira City (formerly Taira Town) was merged with surrounding cities, towns and villages to form Miyakojima City. A civic center built on the empty lot where Miyako Gongen once stood was newly rebuilt at another location. A plan to restore the former Miyako Gongen to the place of its origins and build a fine shrine building as the one once there came into being from 2006. The new shrine building was completed at No. 5 Nishizato on June 25, 2010. The three pillars of the deity, namely Kumano Mikami invited from Naminoue Shrine, as well as Toimiya, who used to administer Miyakojima Island, are worshiped at Miyako Shrine. The omikuji is tied on the omikuji stand as a procedure, but there is no problem with taking it home. If you are taking an omikuji home with you, make sure you treat it with respect. Do not dispose of it in a trash bin or the like. Even if you take it home with you, you are to tied it on an omikuji stand the next time you visit a shrine. Are there any significance with colors of charms? There are no differences with charms because of colors they bear. BR> May I enter into a haiden (hall of worship) and participate in ceremonies? You are permitted to enter into haiden during monthly Tsukinamisai (monthly festivals) and other festivals but you will not be permitted to leave during the ceremonies, which will take about 40 minutes. Please remain silent while a ceremony is being conducted. Please refrain from taking photographs. You may not enter when someone is receiving a private blessing. Please tell me the order of omikuji fortunes. The fortunes of omikuji in the order of good to bad is daikichi (excellent luck), kichi (good luck), chukichi (intermediate luck), shokichi (small luck), suekichi (least luck) and kyo (bad luck). Where should I place a talisman? A talisman from Miyako Shrine, a talisman from Ise Shrine and a talisman for household safety are placed in a room where family members gather (such as a living room). A talisman for business prosperity is placed in an office of a company or store, or near a cash register and the like. A talisman is placed at a location that is higher than the eye line, whenever possible. In any case, if a household altar is available, a talisman should be placed on such altar. It would be acceptable to place a talisman on a wall or a column by attaching it with a double-sided tape or the like. A talisman is placed on the northern wall (with the talisman facing south) or on the western wall (with the talisman facing east) as much as possible.